Telescopes are an excellent way to explore the skies and locate specific objects with better results than with binoculars, even from quality brands, such as Celestron. The Meade ETX-70 telescope is a quality telescope at an affordable price. The company is known for quality scopes, implementing emerging technologies, and the best accessories. The quality components and easy operation make this an excellent choice for a first telescope for kids and adults with an interest in astronomy. The Meade ETX-70 telescope is an achromatic refractor and features a fast focal ratio, quality optics, and exceptional optical and lens technology. The Meade ETX-70 is designed with motor control mount technology to move with precision. The AUTOSTAR allows you to align the Meade ETX telescope so it will point at the object that you want to see through the eyepiece. The technology tracks the objects and compensates for the rotation of the earth. You can quickly switch between objects from the AUTOSTAR database to bring them into your visual field to see them easily through the eyepiece. Telescopes can be large and cumbersome to move, but this Meade telescope is lightweight and portable enough to satisfy the needs of all users, from kids and amateur astronomers to students and serious enthusiasts. When setting up the ETX-70AT, the most difficult part is to level it and ensure that it is pointed north. You begin by entering the date, time, and your location before locating two stars. To align it, set the scope on the tripod, center the first star, press enter, and then move on to the second star, pressing enter again. Once it is set up, you can enter the object you want to see, and the telescope will beep until it is ready to be viewed through the eyepiece. Telescopes from popular brands like Meade and Celestron enable you to view planets, globular clusters, galaxies, and other objects that can’t be seen with the naked eye. This Meade telescope offers an impressive view of the A and B rings of Saturn, Jupiter and its four largest moons, Mars and its polar ice caps, Orion nebula, horsehead nebula, the moon, and much more. The Meade ETX telescope with tripod is a refractor telescope with an objective diameter of 70mm, focal length of 350mm, photographic speed or focal ratio of f/5.0, and resolving power of 1.6 arcseconds. The eyepieces have a focal length of 25mm and 9mm. The telescope mount features 2x sidereal slew speeds and a GOTO electronic control system. The GOTO system is an excellent feature on the Meade ETX-70 telescope that allows users to spend more time enjoying the view rather than spending the entire time searching for objects. When you have found the object, center on it and press enter, which allows it to synchronize to the object and is particularly useful when finding darker or faint objects. This Meade telescope has a port at the back that can be used to attach an SLR camera to take photographs. As with all telescopes, a dark sky is preferable, especially for viewing smaller objects. The Meade ETX telescope comes with two eyepieces, an easy-to-operate focus knob controller, and accessories. The Meade ETX70 telescope operates on 6 AA batteries. The great things about the Meade ETX-70 are portability, quality and lots of other users to assist you. Mine has the AutoStar function which basically does all the hard work for me. Obviously, I enjoy the Meade ETX-125 for more distant viewing but it's bigger. Obviously, the deep space catalog is much more thorough with the bigger scope but if you are just beginning to try astronomy, the ETX-70 is a great value for the price. Upgrading is easy if you have the cash. And remember, eyepieces that you buy for the ETX-70 will also work (in most cases) on the ETX-125. Meade makes a quality product in a very compact package. This is a great little scope that produces sharp/clear images and is very portable. Easy to transport and set up. AutoStar hand controller fairly easy to use and pretty accurate. Recommended for the "new" astronomer or a "grab and go" scope for the seasoned sky watcher. The Meade ETX 70AT Telescope is different then the larger ETX scopes. This is a refractor not a reflector. The 70mm diameter lens is superb! And the light loss is less with the refractor style scope over the reflectors. With several light stops within the telescopes assembly this prevents unwanted side light often associated with street lights and the sort. In my opinion, this telescope is a great starter scope with all the advantages of the AutoStar system the larger ETX’s have. 4 out of 5 Go Meade!!! it took my sister a few min. to set up and find what they wanted. they have a new celestron over $400 they've been working on for 2 weeks and still have not zeroed in. 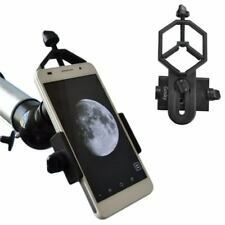 40070 Refractor Astronomical Telescope With Tripod & Phone Adapter Kids Gift US!